In my first game of Dead Cells, I died after about four minutes. In my most recent one, I lasted almost an hour. The time difference between those two attempts says a lot about how Dead Cells evolves as you play it, and how you evolve alongside it. That first game went something like this: I started out in the prison, like always. I picked up a crappy sword and a crappy bow, and I began my escape attempt. I rolled and jumped around a bunch of archers, mutants, and weird bomb-throwing pink creatures. I picked up some scrolls that increased my character’s damage and hitpoints. I killed a bunch more archers and mutants, then made the mistake of dropping into a larger group of them than I’d intended. They killed me. My most recent game, 15 hours later, went like this: I started out in the prison, like always. I picked up a powerful broadsword and an Ice Bow that would freeze enemies in place, and began my escape attempt. I dodged and jumped around a bunch of archers, mutants, and weird bomb-throwing pink creatures, slicing through them with ease. In minutes I had traversed the entirety of the level, picking up every upgrade material and scroll in sight. Using special abilities I’d unlocked, I conjured magic vines to climb and located weak points in the floor to blast through, fighting my way through five more areas, from a toxic sewer to a creepy pirate town. I defeated a hulking boss on a bridge. If I slipped up and took damage, I would heal thanks to my potent health potion. I grew more and more powerful, killing dozens upon dozens of enemies until finally, a fast-moving boss at the top of a clock tower took me down. The more you play Dead Cells, the more it opens up to you. As soon as you’ve grown familiar with one area or set of enemies, it will reveal new ones, stitching its level geometry together just randomly enough to make each new encounter feel slightly tweaked. And for all the permanent skills and item upgrades I’ve unlocked between that first playthrough and now, my skill with the game is the thing that’s changed the most. Turns out the cells were inside me all along. LIKED: Ultra-satisfying smashing and stabbing, rewarding challenge, gorgeous art style. DISLIKED: Less-than-perfect Switch performance, though it's not a huge deal. I also disliked those pirate guys who carry cannons around. They're such jerks! PLAYED: Killed 5,312 enemies over the course of about 15 hours. Still haven’t beaten the final boss, but it’s only a matter of time. Played another hour or two on PC, mostly while the game was still in early access. Dead Cells is a Castlevania-inspired side-scrolling action game from the French developer Motion Twin. In addition to having unusually progressive payroll policies, the indie studio is evidently very good at making video games. Yes, Dead Cells is a winner, particularly if you’re into the idea of slowly rolling a boulder up a hill while periodically noticing that the boulder just got a little bit lighter. In Dead Cells, you play as a nameless prisoner who must slash, pound, and freeze-blast their way clear of an ever-changing magical prison. Well… actually, you play as sentient blob of goo that burbled out of a sewage pipe deep within the prison, saw a headless body laying nearby and apparently thought, “neat, a body.” You slurked over to it and assumed control, placing your gooey self where the body’s head should’ve been. And then you decided to escape from the prison. The prison island that serves as Dead Cells’s setting is not a welcoming place. The monsters and guards blocking the Prisoner’s path hit hard. Traps and spikes are plentiful, and a single tactical slip-up can lead to a quick and ignoble game-over. Every time you die (and you will die), you’ll have to start over from the beginning, stripped of the skills, weapons, and special items you collected during your last time through. Dead Cells is a Rogue-inspired “Rogue-Lite,” in which death means hitting the big ‘ol reset button and taking it from the top. Levels procedurally reshape themselves, routes reconfigure, and hidden secrets appear and disappear, though the game’s overall structure and arrangement remains static. That all may sound daunting – and it should, because Dead Cells is not an easy game – but the designers soften things considerably by letting players work toward unlocking a variety of helpful permanent items and upgrades, each of which works with the others to make the game much less intimidating. Some enemies you kill will give you cells, which you must deposit toward upgrades in between levels. First, you’ll unlock a vial that lets you refill the Prisoner’s health bar once per level. Then you’ll unlock a second charge for that vial, and eventually a third and a fourth. You’ll unlock better starting weapons and the ability to carry more gold over between lives, which makes re-arming yourself at stores much easier. You’ll unlock new and exotic weapons, which are added to the pool the game draws from when dropping one into your game. And you’ll unlock permanent rune abilities that let you reach new areas, which themselves contain even more upgrades. A few hours into the game, I was soaring through levels that had initially given me trouble. Even the earliest areas require a mix of careful strategy and quick reflexes, though. For all its Rogue-ish elements and elaborate weaponry, Dead Cells is a straightforward action slash-em-up, with strong ties to the classic Castlevania series. You’ll pick up swords, whips, firebombs, bows and arrows, traps, turrets, grenades, magic spells, and more, each of which will require slightly different tactics. Enemies each have their own distinct move-sets and tells, and most telegraph their attacks well before launching into them. Dive-bombing an enemy stuns them our kills them outright, and never stops being satisfying. Combat in Dead Cells is aggressive and direct. The Prisoner moves like a thousand-pound cyborg, popping up over ledges and slamming to the floor with a heaviness that sets the action well apart from the sorts of graceful glides and floats seen in other modern side-scrollers like Hollow Knight or Ori and the Blind Forest. 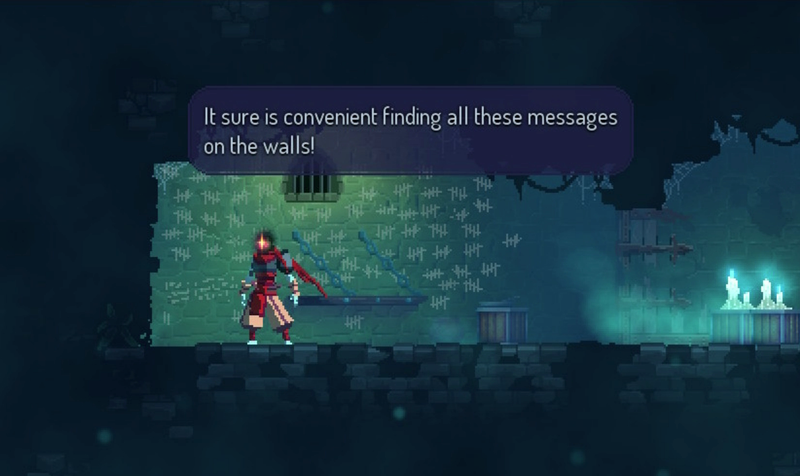 I’d grown so used to the former game over the last month that I initially found Dead Cells’s movement to be awkward. The Prisoner is more Terminator than acrobat, and thus more concerned with brutally slicing through dozens of monsters than with artfully leaping over spikes and traps. It’s anything but inelegant, though. Once I got used to quickly moving around and exploiting height advantages over my foes, each new room started to look like an empowering jungle-gym. Whatever weapons the Prisoner may be holding, their two most useful moves are their dodge-roll and ground-slam. The roll will carry you straight through enemies as well as their attacks, lending you an empowering number of potential invincibility frames (“i-frames,” in the parlance of this kind of game) and making it possible to escape the hairiest situations unscathed. The ground-slam, meanwhile, lets you crash into the earth from any height while dealing damage to foes caught in the proximity of your impact. Dead Cells’ ground-slam is fantastic, and few things in the game are more satisfying than the squelch of an enemy crushed by a perfectly aimed dive-bomb. Unlockable challenge rooms mix and match enemies, loadouts, and bosses even more than the main game, giving you a time limit before which you must reach and defeat the boss. Dead Cells’ randomly rearranging levels aren’t actually as random as they first seem. After an hour or two, I was able to unfocus my eyes and see each one as an unchanging mass of constants and variables: there’s always a store, there’s always a treasure chest, and there’s always a timed door that unlocks if you can reach it fast enough. The toxic sewers always have those exploding poison bats, and the ramparts always have wizards who shoot at you through walls. The Black Bridge always comes after the Ossuary, with the Stilt Village coming after that. Traversal runes gradually open up new paths through which to move through the game, but the arrangement remains set. The levels are numerous and varied, though there are only a handful of proper boss fights on the path toward the finish. That helps the game feel more focused, but I had been hoping for a few more distinct showdowns to shake things up. Given that Motion Twin is already working on free DLC, I’m optimistic that the number of levels, enemies, bosses, and gear will continue expanding well after tomorrow’s release date. For now, the template upon which the game projects its procedural level design is defined enough that, purely in terms of level layout and boss positioning, each playthrough eventually starts to feel more or less the same as the last one. 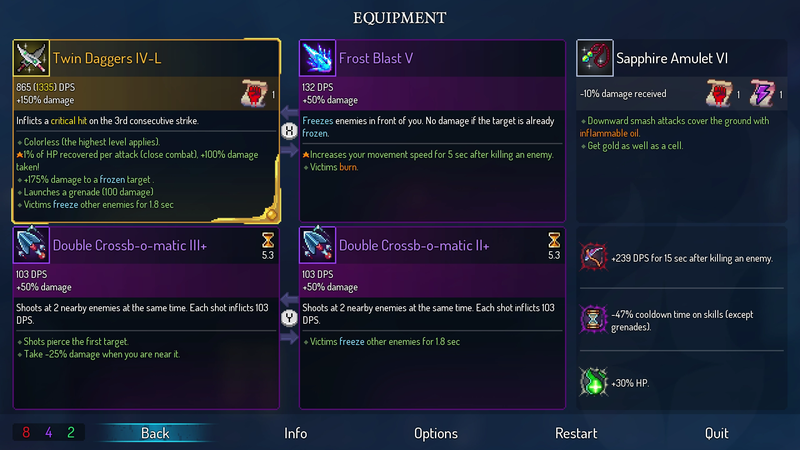 Far more impactful are Dead Cells’ random upgrade and weapon drops. You can carry two weapons and two “tools” at any given time. Your loadout on a given playthrough will depend on which weapons the game drops for you, either as pickups in the world or at stores. The further you’ve progressed in the game, the more weapon possibilities you’ll have unlocked, and the more varied each playthrough will become. Oh, how I will miss this loadout. Melee weapons range from stunning hammers to quick-stab daggers to heavy broadswords, and ranged “tactics” weapons go from bows to ice-blasts to throwing knives. There’s also a whole green-coloured class of shields you can equip in place of a weapon, which let you block and parry incoming damage, but in general I find I’m nowhere near as effective as I am with a melee + range loadout, so I’ve mostly avoided them. Tools, meanwhile, can be remote-operation turrets, napalm grenades, and even rare magic abilities, like a single-use vampirism spell that lets me replenish precious health as I do damage. Each tool combines differently with other tools and weapons, and their randomly generated attributes – ”Does 50% more damage to frozen targets,” say, or “Does 100% more damage, but you take 100% more damage” – make change things even more. On a given playthrough, you’ll have to improvise and adapt to whatever gear the game has chosen to give you. In most action-RPGs, I tend to pick a single loadout and rely on it to the neglect of all other possibilities. That’s doubly true in a Souls game, where I invest in certain attributes that make certain weapons more effective than others. Dead Cells takes the opposite approach, pushing you toward new weapons at every opportunity and never making you feel too tied to one set. While I was usually able within a couple of levels to re-create my chosen loadout of “freeze + quick melee,” I still regularly find myself forced outside my comfort zone. Dead Cells’ art style is its most immediately striking attribute, as well as what ties it most directly to the lineage of Konami’s beloved Castlevania side-scrollers. It’s got the lush, neon-drenched retro art style popularised by games like Hyper Light Drifter, mixing modern dynamic lighting with classic pixel-art style. The moon on a forsaken bridge will move behind you in parallax, backlighting characters and background objects with shimmering, shifting rays of light. The Prisoner will smash an enemy into a pile of glorious gibs, pixelated blood and guts raining outward in a colorful shower. The Island is a bleak, deadly place, but also often a beautiful one. I played Dead Cells on the Nintendo Switch, and found the handheld platform to be a perfect fit for the game’s easily readable side-scrolling and bite-sized play sessions. Having previously played a few hours of the early access PC release, I did notice that the Switch version performed noticeably less smoothly than the rock-solid frame-rates I got on PC, with frequent and noticeable dips during levels with a lot of visual detail or enemies on screen in both handheld and docked. The game has already gotten one pre-release patch and will doubtless get more updates after it comes out, so I asked the developers whether the Switch version might have its performance brought up to a solid 60fps sometime soon. “We’re happy with the version that is out there right now,” Motion Twin’s Benjamin Laulan told me in an email. “While we’re aware that there are moments where you drop down to 40-50fps on certain levels with stacks of enemies on the screen we think that the vast majority of people will be ok with this as it is.” He said that if they hear from players that the current Switch performance isn’t good enough, they’ll go back in to get it more solid, adding that the only reason they hadn’t done that from the outset was that it would’ve required a lot of low-level optimisation work that would have delayed the game’s launch. He also said they’re currently focusing on the game’s first batch of free DLC, and that they’d turn to further optimisation after completing that. So, while it’s not as smooth on Switch as I hoped it’d be, that might improve down the road. The performance dips haven’t been a huge deal for me, either. While there have been some rare instances where I’ve felt like slow performance has made the game more awkward to play, I haven’t minded for the overwhelming majority of my time playing. It only really sticks out if I hop over and play a bit on PC, where the ultra smooth performance and attendant extra visual information make the game easier to read. I can’t easily throw the PC version into my backpack and play it at the park, though, so I’m sticking with the Switch version. Dead Cells has almost no story to speak of, and what tiny narrative nuggets one can glean from notebooks and wall-scrawlings are sardonically framed by the game and all but dismissed by the Prisoner. The Island is a bad place, made worse by some sort of infection, and your consciousness, whatever it is, is willing to possess an endless chain of corpses in order to get free. There’s no operatic narrative throughline like in Symphony of the Night, nor are there hidden lore-wells to plumb like in Bloodborne or Hollow Knight. Aside from some sparse worldbuilding, the only story here is the story of moving forward, killing things, and gradually getting better at it. When a game is as finely tuned as Dead Cells, that tuning is all it needs. I’ve found its punishing, live-die-repeat rhythm plenty engrossing without a narrative wrapper, to the point that more of a story might just be a distraction. The final boss – who I still haven’t beaten, despite drawing tantalisingly close a couple times – feels almost like a secondary objective. At the start of each new game, I scarcely pause to consider where I’ll end up, nor do I entertain the hope that maybe, finally, this will be the time I get to the end. I’m content to plunge once more into the dungeon and let the chips fall. My final destination is less important than the ever-changing path before me, and thoughts of the future are eclipsed by the spirit of the moment.